Soy lecithin is a pervasive ingredient added to most of the processed foods such as cereals, soya milk and health supplements. It is an emulsifier. It breaks the oil particles and makes them easy to digest. This potential makes it a popular ingredient in nonstick cooking sprays and soaps. It is considered that due to the presence of choline it is good for the heart and brain. But potential danger of consuming soy lecithin has recently been a topic of debate. Lecithin is a mixture of phospholipid, choline, glycolipids, phosphoric acid, and triglycerides. It is derived from egg yolk, Rapeseed, milk, soybean, and sunflower. How is soy lecithin made? Being one of the cheap crops in the US most of the food companies uses soya bean to derive soy lecithin from it. 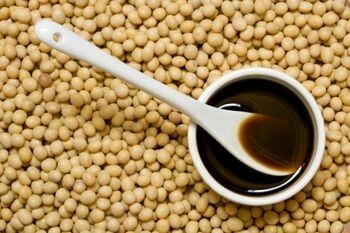 With the help of a chemical solvent called Hexane, soybean oil is extracted from the raw soybean. After this extracted crude oil is mixed with water until lecithin gets hydrated and separated from the oil. After this hydrogen, peroxide is used to bleach and dry lecithin. Thus, unfortunately, the production process adds solvents and pesticides to soya lecithin. Research shows that most of the American market contains genetically modified soy. Although this may not affect the nutritional property of soya bean, but may affect the functions of liver and pancreas. The potential risk to the fetus if consumed during pregnancy- A research conducted on pregnant on newborn rats who were fed at 2% to 5% soy lecithin diet concluded neurochemical and newborn abnormalities in offsprings. So it is better to minimize the soy lecithin consumption in expecting and breastfeeding mothers. Also better to avoid giving it to infants. Cancer- Phytoestrogens present in soya lecithin has a similar effect on the body like the hormone estrogen. Thus, it may increase the risk of breast cancer. It is better if premenopausal women and survivors of breast cancer, including those who are under treatment avoid it. Soy lecithin allergy – It has been found that people who have soy allergy are also sensitive to soy lecithin. So it is better to avoid it and be safe. Negative impact on fertility– Feinstein present in soya lecithin has a negative role in reproduction. It lowers the level of testosterone. Studies conducted on pregnant rats show that offsprings produced have small testis and large prostate glands. It is better to minimize its consumption during reproductive development to avoid sexual dysfunction and reproductive abnormality. Disrupt the absorption of minerals– Phytic acid present in soy binds to minerals like zinc, magnesium, and iron and decrease their absorption. Stomach upset– Some people may not digest oil well and may suffer from gas, abdominal cramps, and nausea after taking soy lecithin. More research in need to be done on soy lecithin. However, It is better to minimize intake of soy lecithin and switch to fermented soy products as fermentation destroys negative part of soy and makes it easy to digest. It is better to purchase products containing organic soy lecithin. You may talk to your doctor about the amount of soy lecithin recommended in your medical condition.